R7Dinc PDC Spa Accessories * HOT TUB THERMAL COVERS | HEAT TRAPPING AND LIGHTWEIGHT * SUNSTAR COVER inc w/Spa order * 3 yr. warranty, Wildwood Rust or Ash Gray. (Included in portable Spa pricing for 2009. Price below if sold separately.) Cover Caddy shown is not included. 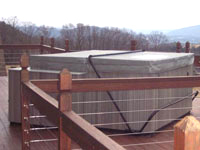 It is common knowledge that hot air rises and most heat lost will be from the surface of your spa, therefore a quality spa cover may be the most important factor in energy savings. PDC Spa covers feature a full length heat seal reducing heat loss from the hinge region, thereby maintaining more consistent water temperature and efficient heating operation. The PDC Spas hot tub cover is available in two colors; Ash Gray to compliment the Slate cabinet, and Rust to pair with the other three cabinet finishes. Covers are backed with a three year warranty. ** Retail $433.00 -R7Dinc wholesale discount as noted plus Tax & delivery.